Gabby Douglas hasn't been able to catch a break: since the Olympics began, she's received a rash of criticism that hasn't touched her fellow Team USA competitors. Douglas, the darling of the 2012 London Olympics who earned the nickname "Flying Squirrel" for her gymnastics prowess, has been criticized for her hair; for not putting her hand over her heart during the National Anthem; and most recently, for the facial expressions she made while her teammates competed. Now, Douglas has responded to being bullied on Twitter for things that, for any other athlete, wouldn't be an issue at all. "She's had to deal with people criticizing her hair, or people accusing her of bleaching her skin," Douglas' mother, Natalie Hawkins, told Reuters. "They said she had breast enhancements, they said she wasn't smiling enough, she's unpatriotic. Then it went to not supporting your teammates. Now you're 'Crabby Gabby,'" Hawkins continued. On Aug. 11, Douglas' teammates Simone Biles and Aly Raisman took home the gold and silver medals, respectively, for the women's all-around. When Biles and Raisman were announced as the winners, Madison Kocian and Laurie Hernandez both leapt to their feet with joy, while Douglas remained seated. Although Douglas was clapping, viewers at home shamed her for somehow not being excited enough for her teammates. Three days later, Douglas issued yet another apology. "I apologize if that made me seem to be really mad in the stands," she said. "I was supporting Aly. I will always support them and respect them. I don't want anyone to take it as jealous or I wanted attention. Never. I support them and I'm sorry I wasn't showing it." But she wasn't just apologizing — and honestly, she didn't have to apologize at all. Douglas used the criticism she's received as a way of reminding people their words have serious consequences, even if the distance provided by social media and Douglas' celebrity status make her seem untouchable. "When they talk about my hair or me not putting my hand up on my heart or me being very salty in the stands, they're really criticizing me, and it doesn't feel good," Douglas said, beginning to tear up. "It was a little bit hurtful." She also revealed that she's been trying to avoid reading online criticism. Thankfully, not everyone is using their online platform to shame Douglas, and many have taken to social media to defend her from these unwarranted criticisms. "You've got gold — they've got complaints" is a perfect way to sum up the backlash Douglas has been receiving. 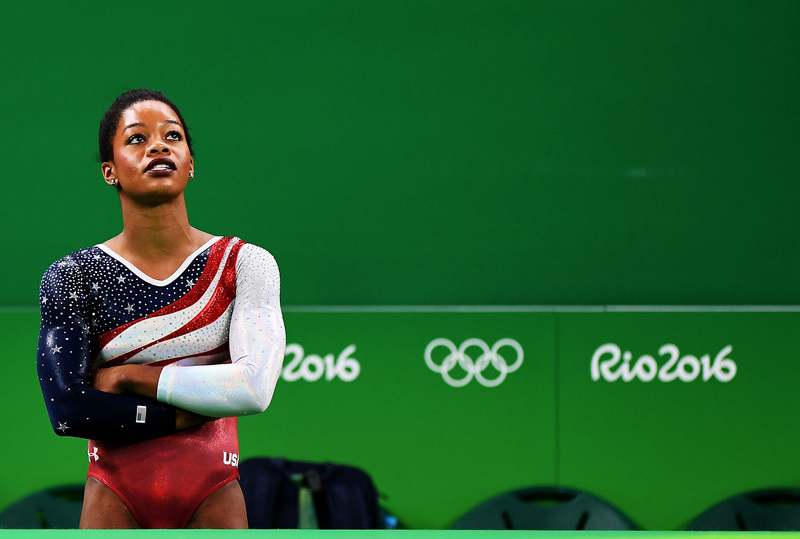 Gabby Douglas doesn't need to style her hair in a particular way, put her hand on her heart, or perform enthusiasm in a way that is not her own. She's not at the Olympics to get people to like her; she's there to win gold, and that's what she did.